A logo is meant for a company but should it necessarily show its business? A complete novice designer makes sure that a company business shows up in a logo design. While there is nothing wrong with a logo literally telling about what a company does, that is not a strict condition to creating a logo. A lot has already been said and written about logos. They are, today, a formidable business signs or symbols that we can spot everywhere in a market. They appear on all products or services, advertisements, and on all online and offline platforms. These symbols show us the business that a company owns. But a logo is not necessary just for a company but for its customers as well. Customers want to establish the authenticity of a product by looking for its company’s logo on it. If the logo appears somewhat different, the customer may take the product as doubtful. Legendary designer Saul Bass once said that ‘logos are a graphic extension of the internal realities of a company.’ This quote clearly stats about the role of a logo in expressing what a company does. It also shows the developmental and evolutionary phase a company is going through. This is the reason that whenever businesses evolve and add more products or markets to their profile, they usually redesign their logos. A business logo design is primarily about drawing the attention of potential customers. But that is only the primary intention. More than that, the design should be such that it stands out from the competitors’ logos. That is also a way to convey that the company is unique, professional, and different in its niche market. However, there is no one way to design a logo to convey a message. There are, in fact, many types of logos including the ones that are based on text, image, and symbols only. But whichever type of logo a designer may think of, one common characteristic of great logos is that they all are unique in their way. But a unique logo can be defined in many ways. Many such logos have company names. Others have elements related to the company’s business. One of its chief characteristics of a unique logo is that it does not speak directly about its company’s business. A logo that is letterly representing an industry is usually not considered as an ideal symbol as it does not appeal to the aesthetic sense of people. They want to look at something that is surprising, aesthetical, and memorable. There are many inspirational examples of logos that give no inkling of the business it represents yet they are the most recognized symbols in the business world. Take the McDonald’s logo. The company runs a chain of fast food restaurants across the globe. But its logo does not give us any hint of the business. The logo has no burger, pizza or any other fast food item or a restaurant image. Instead, what we see is an image of yellow arches. Now, whenever we look at those yellow arches, we all know that it is a logo of the fast food company McDonald. We know that the restaurant displaying the logo belongs to and serves the McDonald fast foods. The Apple Company has nothing to do with producing or selling apples, though its logo is a bitten apple. The company is in the business of making electronic items like computers and smartphones. But the bitten Apple logo design stands for the byte which is a unit of memory size in electronics. Take another example of The Tiger Woods logo. Tiger Woods is a legendary golf player. He now runs a company that handles businesses in many sectors including restaurants and organizing golf tournaments and designing golf courses. But his company’s logo design has no golf elements. Instead, the logo has three cones only in black. But these cones have the letter W in white space. The tree triangles also represent the tiger’s paw, its stripes, and the ‘woods’. During his playing days, Tiger Woods used to hit into the trees. So, the cones stand also for the trees. That is how logos create brand identity. 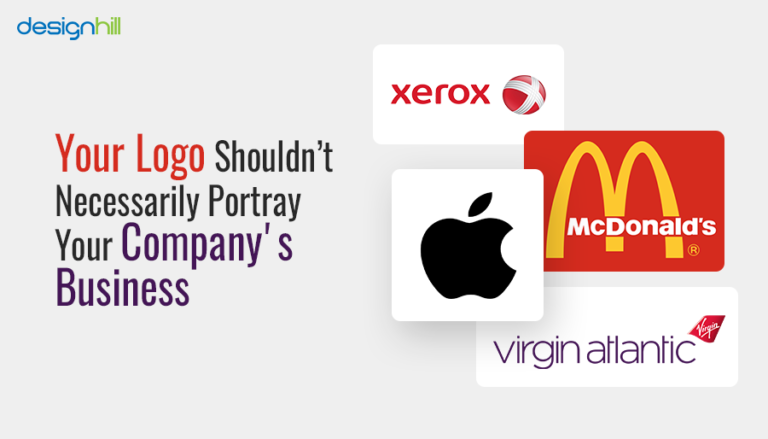 Similarly, The Virgin Atlantic logo does not have any airplane in its design through the company runs the airlines. It is having just the company’s name and nothing else. Take also the example of Xerox logo. The Xerox Corporation Ltd is in providing document management technology solutions such as photocopiers and printers, and related services. But its logo has no elements showing any sign that it is a document management company. Instead, the logo designer of Xerox logo incorporated the company’s name in lowercase letters and a red sphere with a white cross. These are some of the logos that build an identity of a company without literally representing its business. But to know why a logo need not have any elements of an enterprise’s business, first, understand why you need a logo. 07. Why Do You Require A Logo? Even if the business of a company is not integrated into its logo design, people easily recognize it. This is because these brands exactly know why they need a logo. So, here are some key reasons for a serious business requiring a logo. You need a logo as it can help customers know who you are and what your company makes and sells. Your logo has some elements with some meaning that potential customers can pick. A unique company logo represents your company, but it also distinguishes your business and what you do from your competitors. So, the design should be such that it looks entirely different from your competitors’ logos. That is important as you would like to give the impression of being a company that provides unique products, services or solutions. Another primary purpose of a logo is to make customers accustomed to a favorite brand. Although the quality of products or services is the primary cause of people sticking to a brand, still an amazing logo design can play its role in liking a brand all the time. A logo that is easily recognizable and familiar helps a lot in building brand loyalty. Now you know that a logo is an essential part of doing business in the modern world. It helps you build your brand recognition and draws the attention of your potential customers. Now, it’s the time to learn to create a logo that makes an impression without directly letting people know about the company’s business. Generally, symbols are the way to say something indirectly. When we see a symbol, we understand what it means. There are symbols all around us in a variety of forms. But in logos, you can use them to please your audience with your aesthetic sense. Symbols also are a way to give respect to the human intelligence using graphic designs as you assume that they can understand the meaning without straightforwardly saying it out. For example, the Apple logo is in the shape of a bitten apple, which becomes a modern symbol of computer and electronic technology. The company’s logo has no electronic item in it; still, the message goes to the consumers. If you do not want to use any symbol, just incorporate your company’s name in the logo. For example, Virgin Atlantic logo uses the company name without any designing of an airplane or other related things. In fact, to design your enterprise’s name is the easiest way to make your logo promote your business. When people know your company name from your logo, it naturally markets your enterprise. When you hire a professional graphic designer, tell clearly that you need your company name only in the logo. If you plan to have a logo with your company’s name only, its success and impression on the viewers will depend on your choice of typeface. Remember that most logos get their personality from their use of typeface. So, first know your brand personality of the business and then pick a typeface that expresses the brand well. To choose the right logo font, make sure that you avoid the common fonts. Pick the fonts that are not used regularly to design a logo. Because you need a logo that stands out, use unique fonts or typeface that is not trendy. A trendy font will not last for many years, and you will be redesigning the logo. Also, avoid thin, fragile, and swirly fonts that are difficult to view on a smaller size. Your logo will be printed on a minimal surface as well to promote your business. So, keep the fonts a bit bigger. But ensure that you choose the typeface or font to maintain brand consistency. So, study the client’s web page design and other marketing materials to see which typefaces are mostly used in those designs. Once you have finally given the shape to your logo design, it is better to take the second opinion. You should get feedback not only from the fellow designers but also from people to know their perspective. So, put the logo on your social media page and run some poll to find out what percentage of people like the design. If you get some good suggestions for improvement, give it a thought and do the needful. So, these are the points to consider when thinking of a logo design that conveys your brand message without portraying your company name. When hiring a designer, you need to give specific instructions regarding such a logo. You can also outsource your logo work to Designhill, a leading marketplace where hundreds or talented designers are present to work on your project. Just as you launch your logo contest, many designers will read your brief to do the logo job only as per your requirements. The marketplace gives you access to a winning design at an affordable price. Your logo design can speak for your business without literally telling what your business is all about. You can create one such logo by using a symbol or your company name. Such a design helps in building your brand identity. Next Next post: What Are The Pros And Cons Of Logo Designs?